Who Made the Three-Toed Dinosaur Track? I am an ichnologist, someone who studies the traces and trace fossils left by life: tracks, trails, burrows, and other indirect signs of behavior. Modern and ancient traces alike interest me, as these lend insights on how behavior has changed through time (or not). Wow, look! It’s Thalassinoides in Early Cretaceous rocks of Victoria, Australia! I absolutely love that trace fossil! Wait, come back – where are you going? Was it something I said? You mean to say those words mean nothing to you? (And if they do, you’re either an ichnologist, or you cheated by using “The Google” on “The Internets.”) Well, just for contrast, think way back to when you read the genus or species names of the fossil animals just mentioned and the images those triggered. With the Late Cretaceous Tyrannosaurus rex, you probably thought of a 7-8 tonne, bipedal carnivorous theropod dinosaur, with a huge head filled with giant, recurved teeth, ridiculously puny arms holding only two claws on each hand, and perhaps performing a noble deed, like eating a lawyer off a toilet (and thus doing its part to deter needless litigation). Triceratops horridus, also from the Late Cretaceous Period, is a heavy-set herbivorous quadrupedal ceratopsian dinosaur with beak-like mouth, an enormous bony head shield, and three intimidating horns pointing forward from that head shield, a dinosaur that would never be confused with Torosaurus (oh wait, it is). Dimetrodon, which had a bunch of species placed under that genus, is probably the most famous non-dinosaurian animal confused for a dinosaur. However, this sharp-toothed quadrupedal synapsid reptile from the Permian Period, which preceded dinosaurs by about 35-40 million years, is always associated with its “sailback,” formed by long neural spines. The point here is that people who know nearly nothing about paleontology – but have seen these names corresponding with certain images – later can’t help but associate the distinctive features of these fossils with their names. This generality confirms one of the main reasons why we name things in the first place: so we can remember them. The second big reason why we name things is to communicate about them. Names are a sort of shorthand we use to make sure we’re talking about the same thing. Hence biologists and paleontologists alike use genus and species names in taxonomy, which is the science of classifying life. So it makes sense that ichnologists have adopted a similar process of naming trace fossils, imaginatively called ichnotaxonomy. Think that’s outlandish? Wait, it gets better. They even use ichnogenus and ichnospecies names. Now, you might think that’s pretty cheeky of ichnologists, considering how trace fossils are not the actual or altered remains of ancient organisms, but of their behaviors. Nonetheless, the naming of trace fossils is supposed to serve exactly the same purpose as regular biological taxonomy, which is to remember trace fossils and communicate about them. For example, if someone cries out “Ophiomorpha nodosa!” during a moment of wild, unbridled passion, ichnologists are supposed to think of a 1-5 centimeter wide, knobby-walled, tubular structure with a branching geometry. (Or, at least we try really hard to think of that.) Likewise, during a cocktail party, someone may casually mention Eubrontes – not to be confused with the Bronte sisters or Brontesaurus – which should conjure up an image of a 35-40 cm long tri-radiate structure, with pinching-and-swelling along the length of each radiating part before these taper to claw-like points, either expressed as a natural cast or a depression on a sedimentary rock surface. 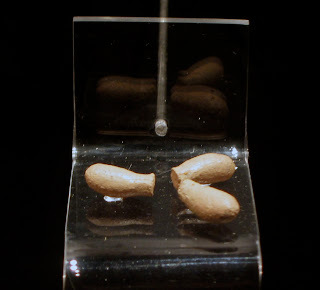 The use of Celliforma in a song lyric (as in, “She tried to Celliforma love, but I ain’t buying none today”) no doubt should inspire an ichnologist to dream of 2-3 cm long ovoid chamber-like structures, rounded at one end and flattened on the other. The trace fossil Ophiomorpha nodosa from Pleistocene rocks of the Bahamas. These rocks are only about 125,000 years old though, so they’re barely considered as trace fossils, but they’ll do for this example. The trace fossil Eubrontes (ichnospecies uncertain) from Early Jurassic rocks of the Connecticut River Valley of Massachusetts (USA) at the Pratt Museum, Amherst College. Several specimens of the trace fossil Celliforma germanica from Late Cretaceous rocks of Patagonia, Argentina, on display in the Museo Paleontológico Egidio Feruglio, in Trelew, Argentina. Notice what I didn’t do, which was to say these were “burrows,” “tracks,” or “nests” (respectively), because those would have been interpretations. I also didn’t say what animals made them because – you guessed it – that would have been an interpretation, too. Ichnogenus and ichnospecies are ideally descriptive, because in paleontology, good descriptions can last forever, but interpretations are always subject to change. Not all ichnologists heed such conservatism, though, and sometimes ichnogenus and ichnospecies names are just plain dumb. Why yes indeed, I am talking about Hondichnus, an ichnogenus given that moniker because the person who named it thought this trace fossil resembled a motorcycle-track pattern. (Sorry, I refuse to link to the reference for this, but if you really must know, it can found through various search engines by using that name.) 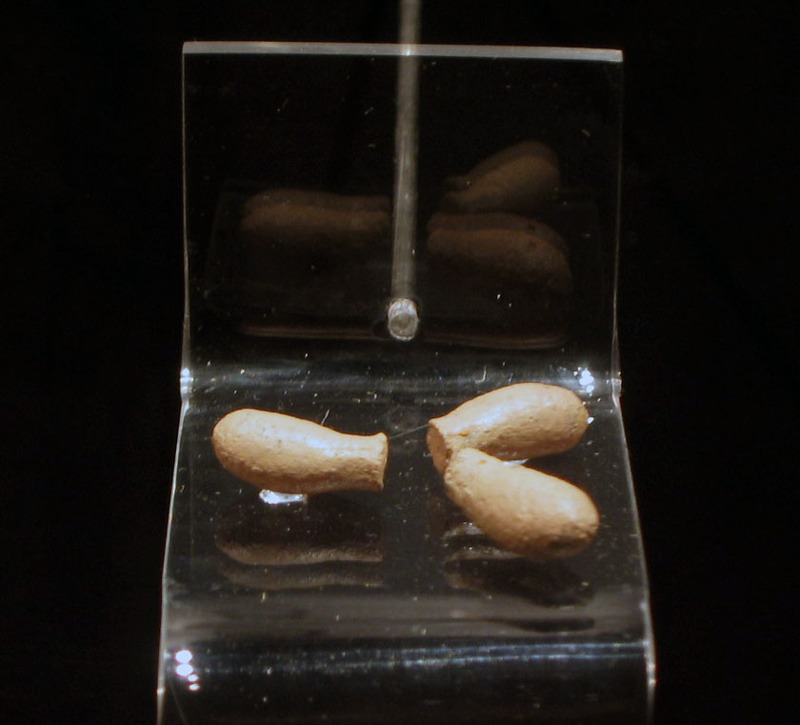 Not surprisingly, no one else has used that ichnogenus since its invention, hence demonstrating what the rest of the ichnological community thought of it. As a result, sometimes trace fossil names seem to die quiet, ignoble deaths, but once they’re in the literature, they can be resurrected. So what does this all of this ichnotaxonomy talk have to do with entries from the last three weeks (here, here, and here), which were about the Early Cretaceous dinosaur tracks of Lark Quarry in Queensland, Australia? In 1979, Australian paleontologists Tony Thulborn and Mary Wade identified the big, three-toed dinosaur tracks at the site as the ichnogenus Tyrannosauropus, which as an ichnogenus had been named by another paleontologist in 1971. As can be discerned from such a name, this ichnogenus was allied with large theropod dinosaurs, such as tyrannosaurs. 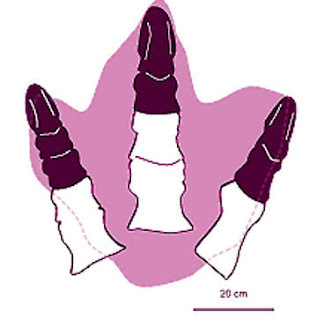 This meant that any subsequent identification of a three-toed fossil dinosaur track as “Tyrannosauropus” also implied that a large theropod made it. Furthermore, the repeated use of this name, especially when referring to the large tracks at Lark Quarry, meant people became less likely to think about any alternative hypotheses for their makers, such as dinosaurs other than large theropods. Fortunately, science tends to encourage a little bit of questioning the status quo. 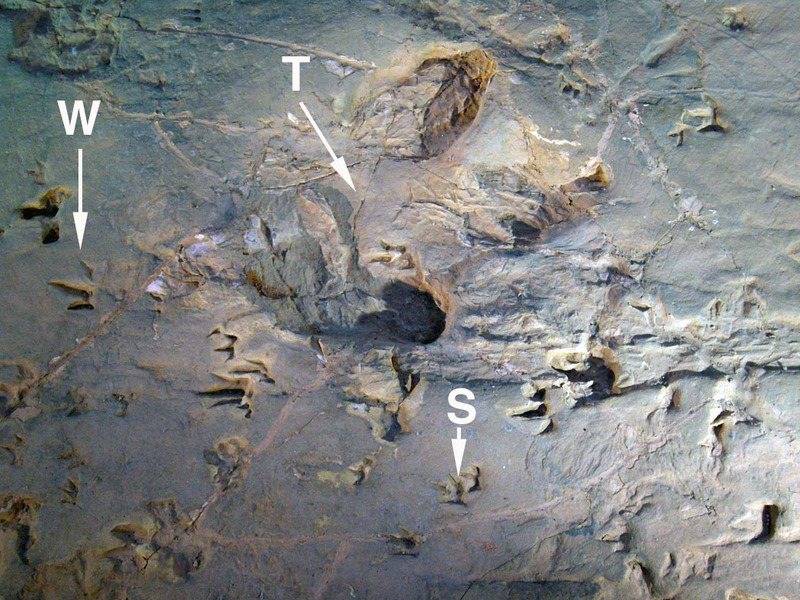 But it still took about 30 years before two other paleontologists – Anthony Romilio and Stephen Salisbury from the University of Queensland – realized these three-toed tracks likely had been misidentified. Instead, these probably belong to the ichnogenus and ichnospecies Amblydactylus gethingi, not Tyrannosauropus. What’s significant about this is that Amblydactylus gethingi is a fossil track associated with large ornithopod dinosaurs, an interpretation based on the overall form of the tracks and how closely these match known ornithopod feet of the same size. Comparison between the foot bones of the large Early Cretaceous ornithopod dinosaur Muttaburrasaurus langondi of Australia and the Early Cretaceous ichnospecies Amblydactylus gethingi, outlined in purple (the preferred color of the enemy). But the track was previously identified as Tyrannosauropus and interpreted as made by a large theropod dinosaur. Do you see where this line of reasoning is going? Illustration modified very slightly (colorized) from Figure 7 of Romilio and Salisbury, Cretaceous Research, in press. Anyway, Thulborn and Wade also proposed two new ichnogenera and ichnospecies for the two smaller and much more abundant tracks at Lark Quarry: Wintonopus latomorum – which were made by some emu-sized ornithopods – and Skartopus australis – which were made by chicken-sized theropods. As mentioned in my previous post, we know the approximate sizes of the trackmakers based on their footprint lengths; these were multiplied by 4.0, which give us the hip heights of the dinosaurs. The small theropods were 13-22 cm (5-9 in) at the hip, whereas the small ornithopods had hip heights up to 150 cm (5 ft), and the “Big Guy’s” (or “Gal’s”) hip height was about 2.5 m (8.3 m). 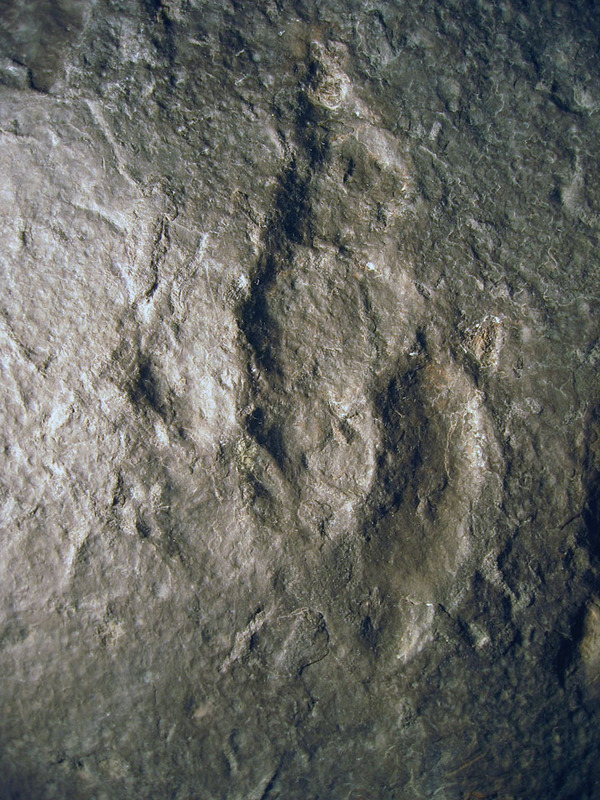 The three ichnogenera of tracks at Lark Quarry, all in one photo: “Tyrannosauropus” (T), which is now identified as Amblydactylus gethingi; Wintonopus (W); and Skartopus (S). Well, that is yet another piece of evidence that resulted in a dinosaur assumed to be more like Hugh Jackman to suddenly transmogrify into Dame Edna Everage. 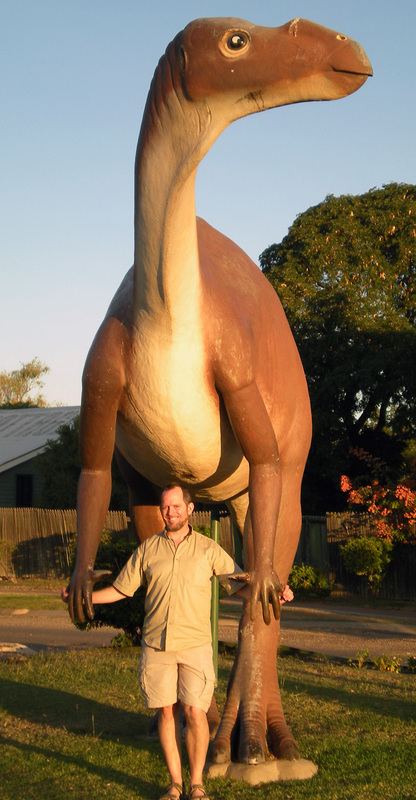 A hip height of 2.5 meters just happens to match the hip height of Muttaburrasaurus langdoni, which is a large ornithopod known from body fossils in rocks of about the same age as the Lark Quarry rocks, from about 98 million years ago. A life-sized reconstruction of the large Early Cretaceous ornithopod dinosaur Muttaburrasaurus langdoni in Hughenden, Queensland, with me underneath it for scale. Just out of view in the background is a closed pub. Oh what a terrible place, is a pub with no beer. Photo by Ruth Schowalter. Remember the opening scene of the Lark Quarry story, in which a large ornithopod plods onto the Early Cretaceous lakeshore? An ornithopod about half the size of Muttaburrasaurus left tracks on part of the exposed surface at Lark Quarry before the arrival of the smaller dinosaurs. Although I don’t know whether ichnogenus or ichnospecies names were applied to those tracks, they may have represented a missed opportunity, as they could have been compared to the 11 “Tyrannosauropus” tracks to test for differences. After all, juveniles, subadults, and adults of the same species of ornithopod could have made footprints that, 100 million years later, would have been given three different names by ichnologists, erroneously leading some to think that perhaps three different species of dinosaurs made them. This is the continuing challenge of ichnotaxonomy: how to separate descriptions from interpretations when making names. • A sizeable ornithopod dinosaur walked onto the lakeshore. • A stampede later took place on that same lakeshore, involving more than 150 dinosaurs. • The stampeding dinosaurs were comprised of two species of small dinosaurs, one a theropod and the other an ornithopod. • These dinosaurs ran at high speed and in the same direction. • A large dinosaur walked onto the scene from the same direction in which they ran. In other words, the small dinosaurs ran directly toward the big one. Persuasive circumstantial evidence leads us to conclude that they represent a stampede - that is, a wild, unreasoning and panic-stricken rush to escape the threat of danger. What could have caused such presumed panic? Just as an anecdotal and speculative explanation, I have watched flocks of small shorebirds flee/fly as a group and move toward and then around me when I approach them on foot, even though predation is not my intent. After all, my 1.65 m (5 ft. 6 in) height must seem rather intimidating to such tiny animals. As a result, I also can’t help but imagine how a small, chook-sized dinosaur would have likewise tried to avoid being underfoot when a 3-5 tonne herbivore arrived on the scene, if for no other reason than to avoid being squashed. So you might say, they were running flat out to avoid being flattening. The moral of Lark Quarry is that dinosaur tracks still matter, as do names. But perhaps the most important lesson of all, is that naming something should never stop learning about what is being named. Australian country-singing legend Slim Dusty, singing a lament to the absence of adult beverages in a public bar in his most famous song, In the first version, it’s all sadness and sorrow, but nothing is done other than to whinge about it. The second song is a response to the first, in which “true blue” Aussies decide they’re going to do something to remedy this situation. How does this relate to ichnotaxonomy and the Lark Quarry dinosaur tracks? I’m not really sure, but I think it has to do with variations on a main theme, as well as an excuse to mention beer.